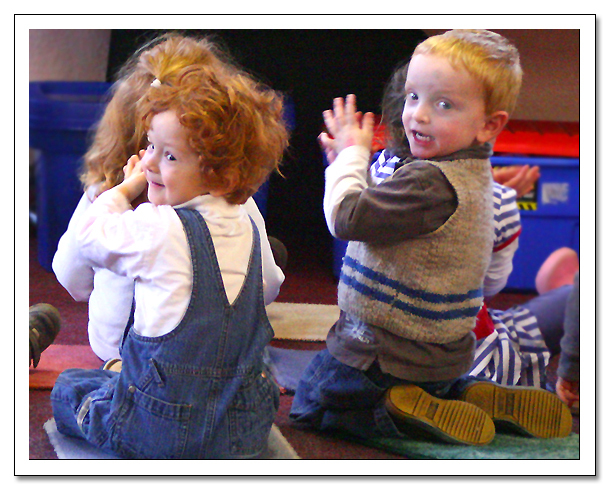 I have been to Fiddlesticks with my eldest son, he experienced the sessions in pre-school. I now go with my youngest son, who is 16 months old. Both enjoyed the sessions as a chance to explore rhythm through movement, games, musical instruments, toys and parachute play. It has helped the eldest and is still helping the youngest develop social skills, as well as co-ordination. Each week there are the old favourites repeated to provide familiarity; such as 'sleeping rabbits' and parachute games, but there are new songs and a different story board counting to or from 5 each week. It's good fun and you get a cup of tea at the end while the babes have a play. I recommend Fiddlesticks even if you are tone deaf like me, you can just join in the actions! Lyndsey's powerful voice and personality can carry the lesson even if you don't know a song, or are all feeling a bit sleepy or shy - and the kids love it. 'I wanted to let you know how much my son has enjoyed Fiddlesticks and how much it has contributed to his enjoyment of and interest in music (e.g. after you started the chime bar work, it inspired him to sit down at the piano and off his own bat work out how to play 'Rain is Falling Down', which he was very happy about!) So thanks for all your work. I have been going to Fiddlesticks for over 5 years now. My son started at 6 months and moved through the groups right up to when he started school. He (and I) loved every class and were very sad to leave. My second child attended from birth with her brother and is still going strong at 3 years old, she adores it and her nursery days are booked to ensure she can still do her Fiddlesticks. The classes are well structured and tailored to varying age groups to ensure participation, fun and interest for the full duration from even the youngest of members. I cannot think of a single other activity I have pursued with my children over so many years. I can also say that I have in no way had enough yet and just glad I have at least another year of fun at Fiddlesticks to share with my daughters. Thanks Lyndsey (and Kay of former years) for adding so much to my children's first years.